Qatar Waging Influence Operations Across U.S. While Qatar has for years funded prominent White House-tied think-tanks such as the Brookings Institution, the extent of its massive influence operations did not fully become clear until last year, when it was alleged that Doha secretly funded hack attacks on some 1,500 individuals, including prominent D.C. political insiders. However, that just scratches the surface of the country's clandestine influence operations, which includes the funding of U.S. public school curriculum and training programs for local police forces, a panel of experts revealed during a Wednesday conference examining Qatar's efforts to win over international powerbrokers. "What we really see is the Qataris are playing a very clever game," said Ronald Sandee, a former senior analyst for the Dutch Military Intelligence, who was one of many allegedly hacked by Qatar. In addition to hiring former spies from the British intelligence services, Qatar is believed to have conducted spy operations on enemies and allies alike, Sandee said. This includes a massive and ongoing scandal with the FIFA soccer organization in which Qatar—the host of the 2022 world cup—is believed to have offered bribes to scores of officials. "In general, the Qataris just want control and want to know what their opposition is doing," Sandee said, discussing how scores of Qatari officials tied to the government allegedly ran information operations and other illicit campaigns related to the FIFA scandal. As Qatar deals with the fallout of a break with its onetime Gulf nation allies, primarily Saudi Arabia and other Gulf Cooperation Council members, the country has grown closer to Iran and continues to maintain ties with numerous terror groups, including Hamas and Hezbollah. At the same time, Qatar has enjoyed close military relations with the United States and plays host to the Al Udeid Air Base, which is critical to American counter-terror operations. These ties have pulled Qatar in multiple directions and have contributed to fears among U.S. national security officials that the country is causing more harm than good. "The reason they're so helpful in counter-terror operations is because they know all the terrorists because they fund them," according to Jim Hanson, a former U.S. special forces officer who now serves as president of the Security Studies Group. "They are deeply in bed with all the bad guys so they us on all sides. They use us as air cover for their malign influence to all the extremist groups around the world." In addition to the alleged hacks, which are believed to have in part been conducted on U.S. soil, experts worried that Qatar's stealth funding of American universities and think-tanks could lead to Doha underwriting U.S. foreign policy in the region. Qatar has "spent billion of dollars in the U.S. trying to influence not just colleges … but also public schools and police departments," said Gregg Roman, chief operations officer of the Middle East Forum, which sponsored the event along with numerous other non-profit organizations devoted to studying the Middle East. Through its Qatar Foundation International, or QFI, a mostly state-run group, the government in Doha has doled out more than one billion dollars to American universities, according to Oren Litwin, of the Middle East Forum's Islamist Money in Politics Project. "Qatar has become the single highest funder of American universities," Litwin said, explaining that many of the programs focus on Arab language training but also include a level of cultural indoctrination sympathetic to Doha. Qatar also funds anywhere from 2,500 to 3,000 training programs for American students in various schools across the country, Litwin said. 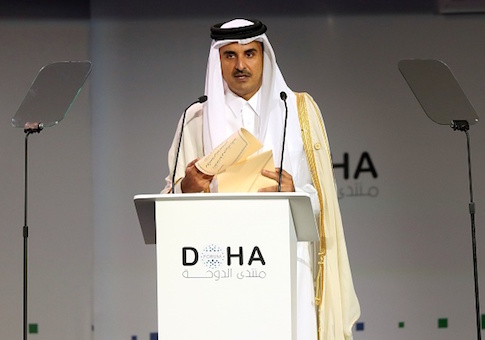 Qatar is "trying to seize the cultural leadership or soft power leadership of the Arab world through this," he said. Many U.S. universities also operate campuses in Qatar, providing the country with another avenue in which to wage information campaigns. "An example of this is Carnegie Mellon University that runs a campus in Doha," Roman explained. "Carnegie Mellon is the number one computer science school in the United States. It's not a surprise that someone at the forefront of cyber hacking would want to have that intellectual property in Doha." All of the panelists agreed that the United States must do better in enforcing foreign influence laws, particularly the Foreign Agents Registration Act, or FARA, which forces foreign governments to disclose who they pay in America for lobbying services. Since Al Jazeera, the Qatar-owned news outlet, was singled out as having helped Doha conduct a hack on the Jewish community, many have called for the outlet to be forced to register with FARA. "When you look at who our allies are, it's not a question of historically have we been friendly with the Qataris," Hanson said. "Is that something we should put ahead of what they're doing to undermine U.S. strategic interests around the world?"